If you love the festive period, then an eight-night Christmas market cruise is for you! Take a trip that visits three traditional yuletide cities in Germany and Denmark, with a cruise on the Balmoral. Pick up handicrafts in Bremen and Hamburg, sail along the Kiel Canal and admire the attractions at Tivoli Gardens in Copenhagen. Germany boasts some of the best festive markets in Europe, with glühwein, steamy bratwurst and gingerbread hearts on tap. Pick a German Christmas Market trip that visits the famous Christkindlesmarkt in Nuremberg; the Eisenach Christmas market in the UNESCO World Heritage Wartburg Castle; Erfurt’s medieval market; and Dresden’s Striezelmarkt, Germany’s oldest Christmas market. Those looking for something a bit different should try the white Christmas at Sweden’s Icehotel, where festive ice sculpting and other events will take place on the frozen River Torne. Spend Christmas chasing the aurora, sledding with huskies and joining a torchlight procession through Jukkasjärvi village for a traditional carol concert. 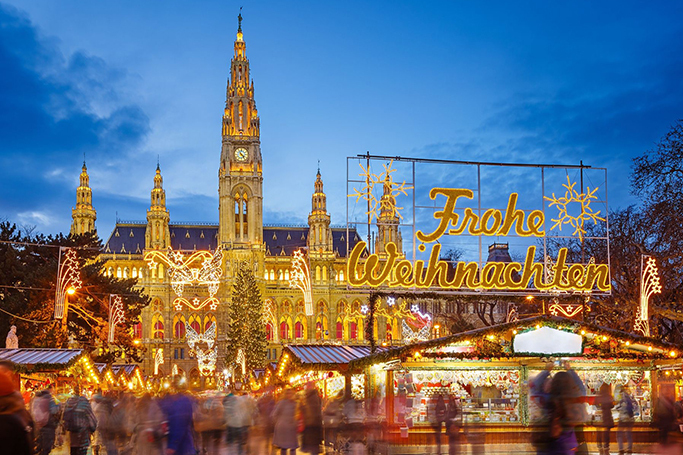 Enjoy elegant festivities in Vienna, where a Christmas village is set up in the grounds of the Belvedere Palace and it’s possible to ice skate at the City Hall Park. Budapest’s historic city centre tranforms into a magical kingdom from November, with more than 100 stalls selling a range of festive arts and crafts, and a giant advent calendar erected on the façade of the Gerbeaud building.